Yesterday I talked about graph databases, outlining what they are and how they work. One of the interesting things about this series is that in many cases, I am posing a question (to myself), trying to answer it, then go and find out what other people do. A single machine solution is obviously a barrier to scaling (and safety, but that is another concern. In a graph database, having relations between the node is the point, that makes sharding a bit more complicated, because unless you store the entire graph on a single machine, you are forced to query across machine boundaries. And you can’t store a graph in a single machine, for the simple reason that it is unlikely that you can limit a graph to be that small. Think about the implications of Six Degrees of Separation for graph databases and it will be clear what the problem is. In real world graphs, everyone is connected to everyone. Now need to touch 3 different machines. Worse, it isn’t the number of machines that impacts that, but the spread of graph nodes across machines in the system. This give us a maximum amount of (depth * number_of_machines_in_cluster) – depth remote calls: With a depth of 3 and 3 machines in the cluster, we would have a max of 6 calls. Neo4j (which seems to be pretty much the default for Graph DBs) doesn’t handle this currently, there are some hints that they intend to offer cluster wide replication, but nothing about design or implementation details. Neo4j does offer write-master/read-slaves approach for scaling out, which is really nice, but even that approach is limited at one point, and in this post, I am focusing on what happen when you go beyond that point. FlockDB (which is what is used by twitter) does include, as part of its design goals: “horizontal scaling including replication”. However, FlockDB isn’t trying to solve the problem outlined above, indeed, graph traversal is a non goal for it. 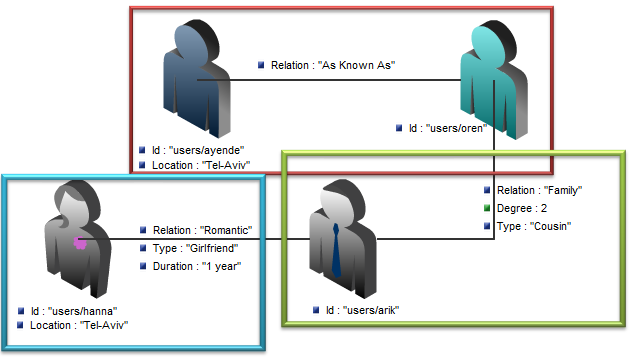 FlockDB is more about finding one level of relations very fast than anything else. In summary, I believe that while you can shard a graph database, it place a very lot limit on the type of graph walking queries you can make. Now, just to give you an idea, Neo4j, for example, appears to be able to routinely handle billions on nodes on a single machines, so you might no need to scale higher than that..